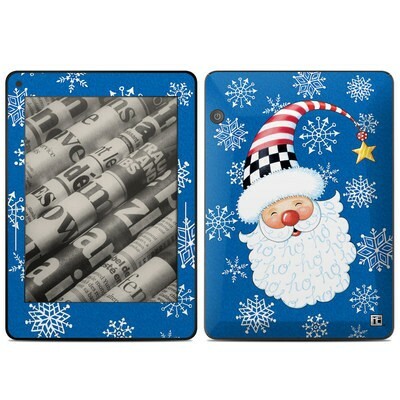 Remember, we offer over 1000 pieces of art as skins for your Amazon Kindle Voyage. Subtle so that it is not distracting but pleasant to look at. The Library skin has always been & always will be one of my absolute favorite skins. And the quality of the skin is unparalleled. Easy to apply, easy to remove w/no residue, and the cutouts are perfectly placed. I love this design - it’s as if it is lit from within. This is really elegant & subtle. This skin is so calming. I always pick my skins and cases to reflect an emotion or my happy place. This one hit right on button! This frog is sooo cute!! The colors are very vibrant! My daughter recently got a Kindle and she's getting used to not having different book covers when she reads a new book. 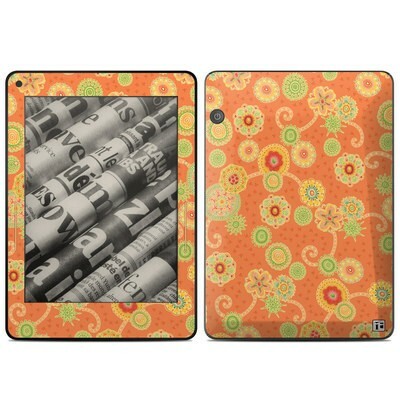 We got her a colorful cover with blue and orange swirls and chose this skin to go with it. The colors were very complementary. It's very pretty, just a bit too colorful for me but she is very happy and loves the combination. I love Decalgirl decals to protect the finish of my tablets and like to changes them out every so often for variety. 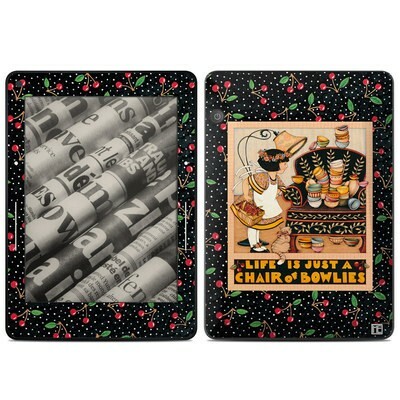 The repeating pattern on Sunflower Patch was perfect for a tablet, eye-pleasing without being too "loud" or distracting. They do a great job of protecting the finish. My first tablet was a white Kindle Keyboard from 2009, when I pulled the decal off it in 2015 to sell it back to Amazon, he white finish was absolutely pristine. I recommend these to anyone who wants to add a little color and fun to their device while protecting the device's finish . So pretty- and a lovely & unique pic of Tink! Beautiful bright colors. Not distracting as a decal over tablet bezels. I got the Humidor skin to go with my Verso Kindle Voyage Case - Cities Red by Sharyn Sowell. The cover was elegant and beautiful and I wanted a skin equally elegant and beautiful. It's a wonderful pairing. Like the cover, it's different shadings of a nice red in a repeating pattern that is eye-pleasingly pretty without being distracting while reading and I absolutely love it. Gorgeous new artwork, love the grip feel of the matte finish. I get/got the most compliments on this skin. It's on a much older Kindle but it's still looking good. Love coffee; live to read while drinking my coffee. Skin is perfect! Great image and fits perfectly! I had this on a much earlier kindle. It is like welcoming a friend back. Nice and thick. Wonderful quality. Easy to apply! Love the pattern. Will get again! Looks great, provides that extra bit of color that I was going for. I'm very happy with the product. This skin is so vivid and bright but not distracting. I only wish there was more purple in it! I love everything by this artist! This skin looks lovely with my gray Origami cover. Never have I been disappointed with a DecalGirl skin. They are truly the best....and made in the USA! 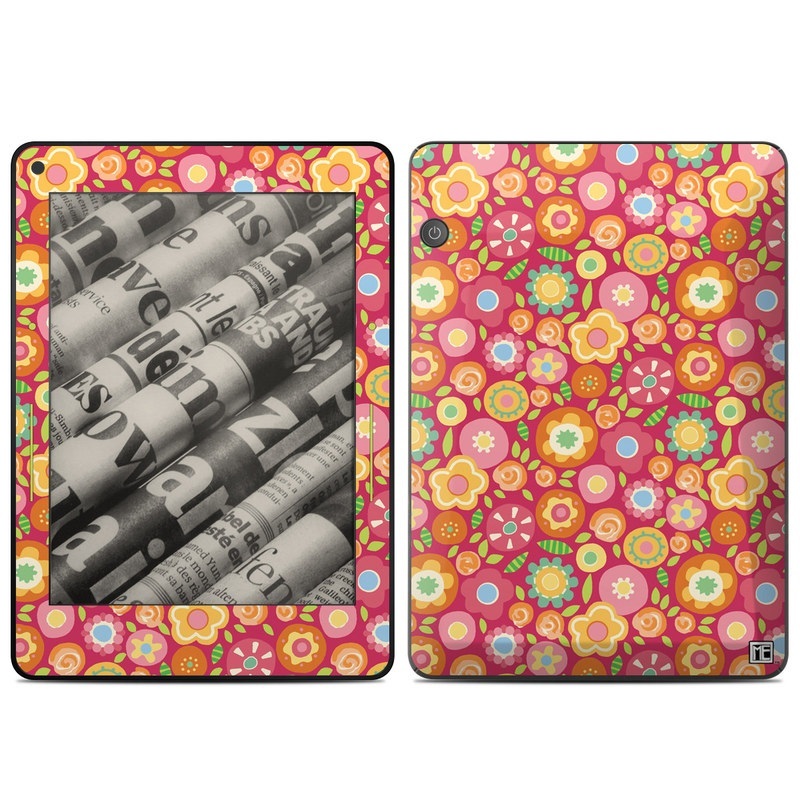 I bought this for my Kindle Fire, which is in the Citron Origami cover. It's as if this skin and that cover were specially made for each other! I would never purchase any other brand skin except for DecalGirl. I know I am guaranteed a quality product. Even though I have my skins shipped SuperSaver, I always receive them quickly. I really love this skin except the fact that it shows all kinds of dirt and scratches. Didn't know I wasn't getting a glossy finish. I love this, it's just so pretty! I only used the full part (the skin intended for the back of the Kindle) which I applied to the front of the Kindle cover and I love it. It makes finding my cover easier and I can easily spot my Kindle from across the room, plus I love this image of Mickey Mouse, it makes me smile. I just wish DecalGirl created a way to get the full image on both sides, for applying onto Kindle Covers instead. The fit is perfect and the design is gorgeous! I can't say enough good things about this skin. The colors, the flowers, the design are all amazing. Looks great on my Kindle. I love the artwork - simply stunning and exactly what I wanted. 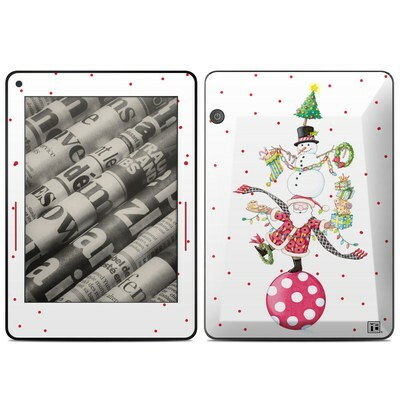 As always, DecalGirl skins are top quality and a cinch to put on - however, this one for the Kindle Voyage doesn't take into account that the back of the Voyage is not flat, but has several angles. I had to leave a couple of minimal creases at the bottom left and right corners (either that or cut the skin - I felt the tiny creases were more esthetic and hardly noticeable). With the case I am using, you can't see the back anyway. I hated to take a star away, but can't give 5 stars for a skin that isn't perfect. Very pretty and the matte is always lovely! This is even better in real life!! Colors are extraordinary, artwork is lovely. Love this skin so much! It fits my new Voyage like a glove and the picture is just gorgeous.